Is calling a saint "holy" blasphemous? If only God is omniscient, omnipresent, and omnipotent, how do Saints hear a million requests for intercession at one time? Why patron saints for different causes? Can't Jesus grant salvation without the help of saints? What about Catholics who pray to the saints? Catholics fully agree that Paul refers to living Christians as saints. All of us in the body of Christ are saints. This is not the only way to use the word "saint." King David used the term "saint" while speaking to his fellow Jews, "Love the Lord all you his saints" (Psalm 31:23 NRSV and NIV). The KJB has over 80 instances of the word "saint" in the Old Testament. (i.e., 1 Sam.2, 2 Chr.6:41, Job.5:1, Prov.2:8, Dan.7:18, 21, Hos 11:12). The word "saint" simply means "holy one" or "sanctified" (Sanctus). It could be a Jew of the Old Testament, a Christian of the New Testament, a faithful Christian living today, or a Christian in Heaven. When Catholics say the word saint, they are usually talking about a specific kind of saint, a canonized saint. Catholics should probably be more explicit so as not to cause confusion. The Church recognizes some Christians (saints) that have endured, entered Heaven and won the crown, and while there, have proven to be serious prayer warriors for us on earth. The Church must be convinced beyond a shadow of a doubt that the saint is in heaven. This is why they go through so much scrutiny over each and every saint. "Indeed, the Saints have ever been, are, and ever will be the greatest benefactors of society, and perfect models for every class and profession, for every state and condition of life, from the simple and uncultured peasant to the master of sciences and letters, from the humble artisan to the commander of armies, from the father of a family to the ruler of peoples and nations, from simple maidens and matrons of the domestic hearth to queens and empresses." - Pope Pius XI (1922 - 1939), Divinus Illius Magistri, par. 99. In 2011, I (Hugh) got married to Diane, and began reading a fantastic Evangelical book called "Love Dare" by the makers of the hit movie "Fireproof" about how to make a great marriage. On page 72 they describe the word "holy" as it applies to your spouse. Canonized Saints were not perfect human beings when they walked on earth. However, they were "set aside for a higher purpose, no longer common or everyday but special and unique" because of their response of obedience and faith to God's call on their lives. Saints are sort of like graduates. I (Hugh) graduated from University and now I'm an Alumni. That means I'm still active with the university but in a different capacity. I am there to support the university now. I could sit on councils and contribute in many ways. There is an obligation to help in some way. I'm not a director. I don't make decisions. I'm not the Dean. I'm just a graduate - an Alumni. Think about Christians in heaven as alumni to the Church. They are not the "Dean" of heaven. They are just servants who've successfully graduated this school of life. They successfully abandoned themselves to Jesus and helped many others do that too. Now they can help us graduate through their prayer and their example. An Evangelical Jeff Lutes, who runs a Christian radio station attributes much of the growth of the Church to their prayers and wrote a book about them. 1 Timothy 2 says there is only one mediator between God and man, which is a different from saying that God wants us only to communicate with Jesus. The chapter begins with requiring intercessory prayer by third parties. "I urge, then, first of all, that requests, prayers, intercession and thanksgiving be made for everyone. This is good, and pleases God our Savior....who wants all men to be saved and to come to a knowledge of the truth." We cannot read the rest of the chapter without considering that overarching idea. Christians in heaven are much closer to Christ than you and me. Evangelicals pray for each other, and they don't say they are taking God's place. When we pray for one another we are participating in the mediation, we are not the mediator. Catholics feel that saints in heaven, including Mary, can pray for us even better than our friends on earth. In Hebrews 8:6, it says Jesus has obtained a more excellent ministry than any of the high priests. In 9:15 and 12:24 the passage goes on to say He is the mediator of a New Covenant, Catholics fully agree. When a saint enters into the joy of their Master, they are "put in charge of many things" (Mat 25:21). Saints are serious prayer warriors. We don't think that praying with the Saints detracts from the worship of God anymore than praying with friends detracts from worship of God, which I do a lot. Saints are not all knowing. They are creatures. This does not take away the tremendous benefit we can get from praying with them. Catholics think "their intercession is their most exalted service to God's plan. We can and should ask them to intercede for us and for the whole world" (Catechism 2683). Requests for intercession of saints is as old as Christianity itself. It is not a construct of the Middle Ages. I visited the Catacombs, just outside of Rome. It was an amazing experience. 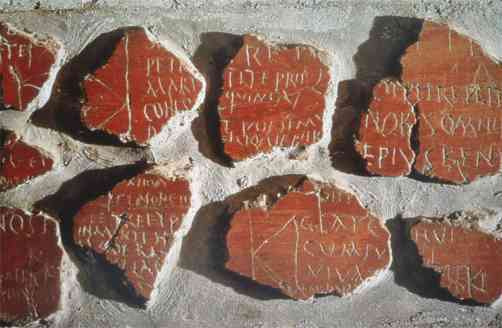 I felt a strong connection with the early Christians who left a written record on the walls of the Catacombs as a testimony of their beliefs. I came upon a wall of hundreds of inscriptions asking the martyred Peter and Paul to pray for them. It was very moving. numerous graffiti that ask for the prayers of the martyred apostles, Peter and Paul. Here is a perfect example of how the Catholic view on death is very prevalent among Evangelicals who have had a loved one die. Sure she distanced herself from her initial instinct of Martin praying for her in heaven, but her initial instinct was better. She said "Why would God need a human to tell him what we need." Yet in the same interview she attributes her escape from the terrorists to the faithful prayers of Christians back home. The Catholic teaching is that there is a communion of saints who are praying for us and we can join them in prayer the same way as we would join in prayer with our friends at a prayer meeting. Scripture says we were "all baptized into one body" (1 Corinthians 12:13). Christians are one body which is not divided by death or anything else (Rom 8:38-39). Christians in heaven are still members of that body of Christ? We are invited to honor the "heroes" of the faith (Heb 6:12, 11:1-40, Jas 5:10-11). I honour those heroes and I feel a unity with them. Here Pastor Rick, an Evangelical, almost perfectly describes the Catholic Dogma of the Communion of Saints. He goes on to quote C. S. Lewis the great Protestant writer who believed what Catholics said about saints. Luckily, most Evangelicals don't believe in "soul sleep." Most studied Evangelicals acknowledge that soul sleep is unbiblical, and that the passages that compare death to sleep in the Bible clearly refer to the appearance of the body after someone dies, rather than the state of the soul. Heaven is not a dead place. Most Evangelicals agree. The best way to respond to this "million prayers at once" objection is to describe something in our lives. We have a little computerized recording studio. It takes 150 hours to record a 3 minute song. With the computer we record each instrument and voice one after another and then mix them all together. So the measure of time we use to record the song is not the measure of time that people perceive when they hear the song on the radio. The recording was not made in "real time." Scripture tells us there are many levels of authority in heaven. (archangels, angels, cherubim, seraphim, etc.) Evangelicals believe angels know what is happening in different parts of the earth at the same time, yet they are not omnipresent. Catholics believe people in heaven are out of time and are enabled to observe and hear what is going on in the earth (which is expressly indicated in Scripture - at least the observing. The "hearing" is a valid deduction). Why do Catholics have patron saints for all different kinds of causes, such as traveling, musicians, lawyers, etc? Protestants have prayer intercessors in their congregations who pray for all kinds of specific causes including government leaders, presidents, law makers, etc. Catholics believe some saints have a special interest in specific causes. Some people have been gifted with specific spiritual charisms (i.e., healing - 1 Co 12:9). These charisms are a gift from God and used during the person's lifetime on earth. The gifts and callings of God are irrevocable (Rom. 11:29), so it makes sense that they would have these same gifts in heaven. God would probably be glad to ask a Christian who was a lawyer on earth to pray for lawyers when he gets to heaven. Isn't Jesus powerful enough to give us Salvation without Saints? ...He [Jesus] has been, He is, and He always will be complete on His own. Absolutely. God is complete and does not need Mary, angels, or saints. Nor does He need you or me. Catholics think it is because of his generosity, his desire to share his graces, his overflowing goodness, and his great Love for us that He asks people to help him. It's like when I ask my two year old daughter to help me. It would be much faster to do myself, but I still ask her because I love her. The Psalmist said, "my cup overflows" (Ps 23). That is what God is. He is overflowing with graces that He shares with his angels and all his children. The martyrs in heaven are saying "imprecatory prayers": pleas for God to rescue and vindicate the righteous. Examples can be found in the Psalms 35, 59, 69, 79, 109, 139 and in Jeremiah 11:18 ff., 15:15 ff., 18:19 ff., 20:11 ff. An angel offers up a very similar prayer in Zechariah 1:12. That's how some Evangelicals approach a relationship to Jesus. I love you so much. I love you so much that I want to spend my time with you. Your mom is welcome to visit our home. Your family is my family, your friends are my friends. The people you love, I will love. We are one flesh and I welcome everyone you welcome. The angel didn't say "hey, don't talk to me, talk to God alone." Angels are servants who know a lot more than us humans on earth. This takes nothing away from God. It simply reflects the overabundance of his grace. The passage supports the catholic viewpoint on the role of heavenly servants rather than the contrary position. John's communication with his "fellow servant" the angel did not mean that they were peers. In an army, a "private" is not a peer with a "corporal" even though the corporal is a "fellow soldier." There is a hierarchy in the military and also in heaven. (archangels, angels, seraphim, cherubim, etc) And at the bottom of this hierarchy are us lowly fellow servants on earth. Most evangelical theologians readily preach this hierarchy in heaven and we Catholics think there is nothing whatever unscriptural about communicating with heavenly creatures. God commissioned us to fight the spiritual battle on earth. Catholics don't think he'll decommission us when we get to heaven. The first thing to notice is that the word "worship" is not included in the definition of "pray." It does not mean "worship." The English language is often limited in that we often have to use the same word to say different things. There are several meanings of the word "pray." When Catholics pray to God they "utter a petition to God." When they pray to the Saints they are making a "devout or earnest request for" prayers from Mary or the saints. In mediaeval times when a royal court official was asking something of a person who outranked him, he would say "I pray thee your majesty." You have to say that in an English accent to get the full effect. The person was simply making a request in a polite manner. There is a song that is a "Top 10" Christian hit by Evangelical singer Chris Rice. It says "I just want to be with you [God], I want this waiting to be over." Catholics say "Amen" to that. At every Evangelical funeral I've attended, I hear people saying "He is with the Lord now." They are confident the person is in heaven. So these good Evangelicals are saying that judgment has occurred. These Evangelicals are agreeing with Catholics that there must be two judgments. A comparison of Evangelical 2 judgments and the Catholic 2 judgments (Particular and General judgment) is here. The Catholic Church is clear about the centrality of Jesus.